Henry Dvorken has been inveting in notes for almost 30 years. 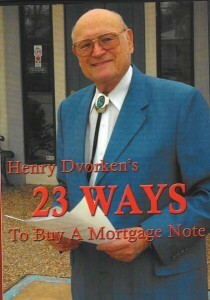 In a two CD set, Henry takes you through the 23 ways to buy a mortgage note. There a few ideas that will blow your mind. You will hit the repeat button a few times when listening to these. If you apply just one of the ideas off of these CDs, it will put money in your pocket.